Nobby's Beach Surf Life Saving Club officially came into being in 1954, as the area between Broadbeach and Miami which had become a favourite for holiday makers. Founding member Phillip Roubin petitioned locals, sought out six Bronze Medallion holders and purchased the land for the first clubhouse. While, this was the initiation of the Nobby's club, patrols at Nobby Beach existed well before this time. During the latter years of World War II, the training army officers established beach patrols to protect the tourists who had started flocking to Nobby Beach. These patrols ceased at the end of the war and did start again until almost a decade later when Roubin founded the club. Roubin took on the role of inaugural secretary and was joined by Morrie Cave as Club Captain, Martin Purcell as foundation President and the late George Reagon - who later became the first secretary of the Queensland Liberal Party. 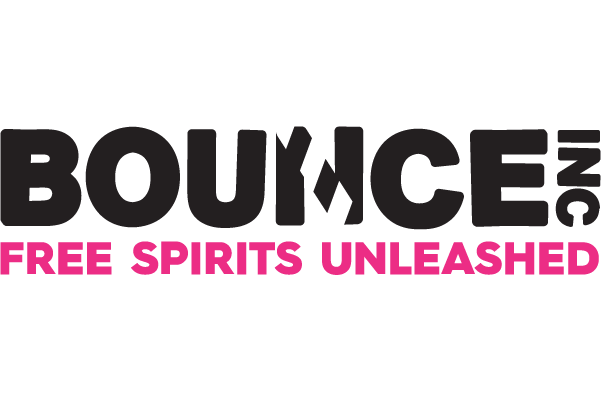 The original members, all of whom have passed away, included Frank Purcell, Tony Hughes, Les Powell, Les Hughes, Arthur Sykes, Tom Sturdy, Henry Bamfeld, Cyril Smith and C. Frazer. Roubin was eventually to spend 22 years in the President's chair, finally stepping down in 1979 as a Life Member. The formative years were best described as "rugged". The first clubhouse and boatshed were crude shelters that were replaced five years after the club's birth. The new club was built, but nature was not kind to it. Sitting at the beachfront, it has been victim over the years of the shocking erosion plaguing the area. In 1967, it was only club morale and a non-stop, two-day working bee that saved it from sinking into the waves. There were similar scenes again in 1969 and 1974 when huge waves pummelled the club. Fast track eight years, and the club was the first in Queensland to train an all-female cadet team in 1982. Prior to this, girls weren’t allowed to join or compete. 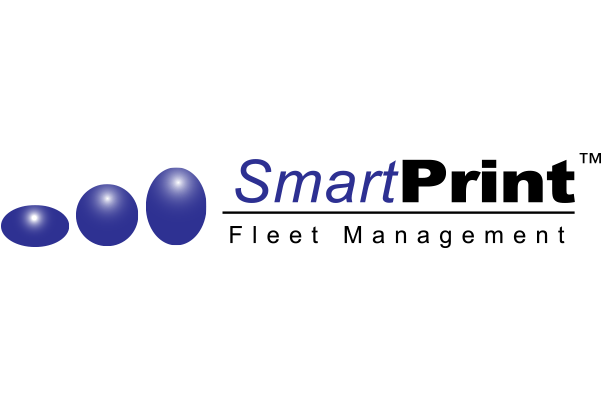 Progressive changes in the equipment being used also began to take shape, transitioning from the Belt & Reel to more effective tools such as Surf Boats and Rescue Boards. 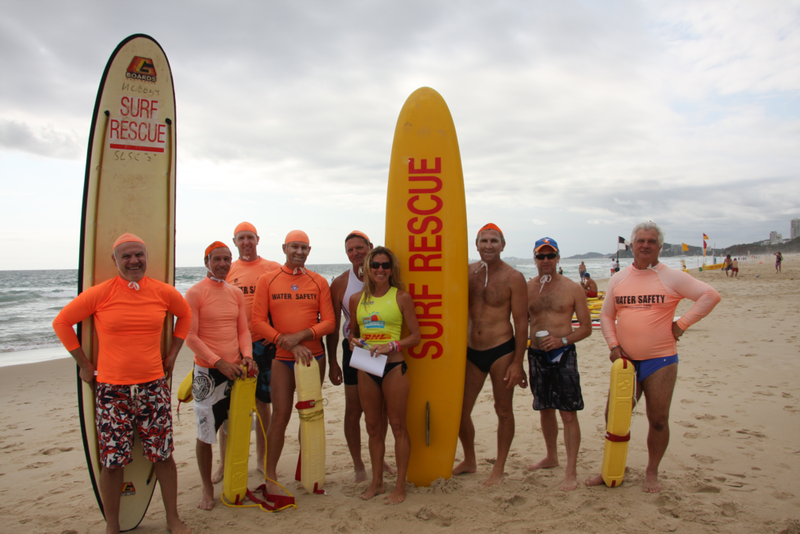 During this period, the Club enjoyed success on a number of fronts, in surf lifesaving and competition. With the renewed success, membership numbers increased, with the likes of football legend Wally Lewis joining the ranks. 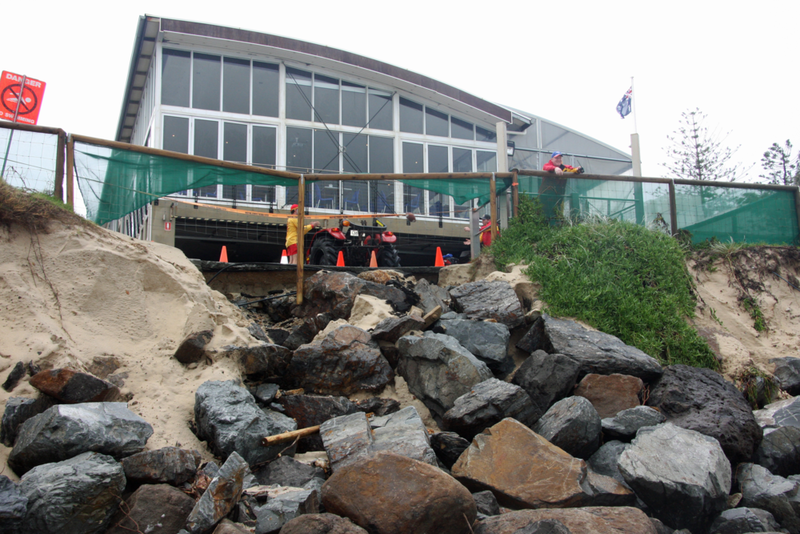 Despite this, the club’s focus never shifted away from surf lifesaving and patrolling Nobby Beach. The club has been eternally etched into Gold Coast surf folklore from events such as the day a training crew caught a 3m shark and dragged it back to the clubhouse, or the day Terry Gotje made a rescue from the helicopter in a Santa Clause suit. Into the new millennium, the club further developed its personnel and membership, resulting a renewed clubhouse to cater for the now membership base stretching from nippers to masters. Clubhouse under threat from severe erosion in 1967. 2011 U15 State Surf Team Gold Medalists. First Team Water Event Gold Medal in 10+ years for the club. Narrowly missed Australian Title on a count back. Multiple cyclonic swells created severe erosion along the entire Gold Coast in 2013. Nobby’s was severely affected, causing alternate patrol operations for a period whilst the dunes were replenished by Council. This resulted in the Tower 23 also being relocated to the Southern side of the club. Celebrating the 2013 Club Champs! 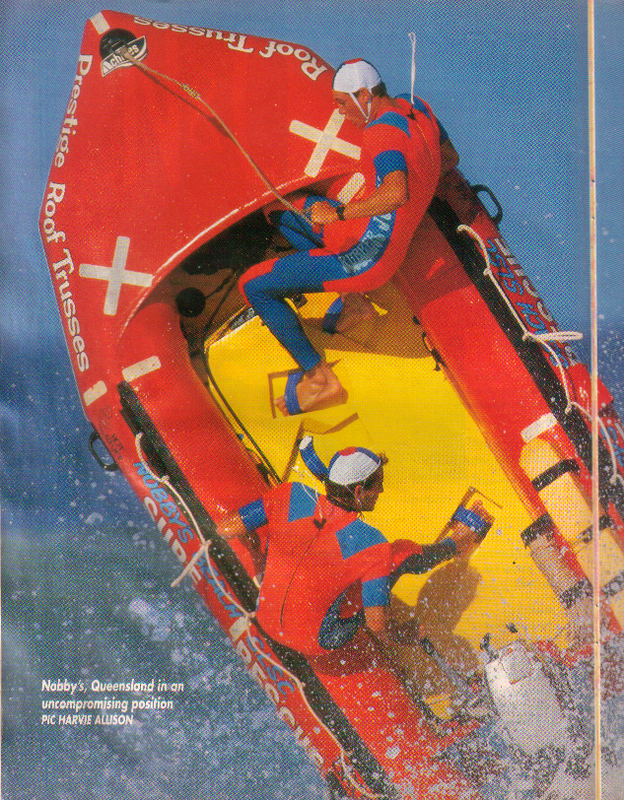 Nobby’s Beach SLSC IRB Team in an uncompromising position at a competition during the 90s. Group Photo of the 1990 Nobby’s Beach SLSC IRB Team. 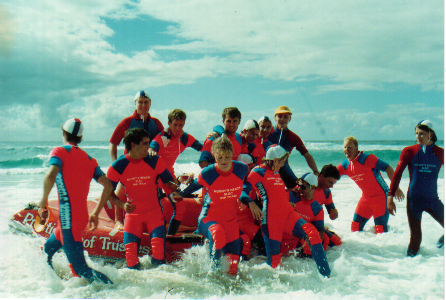 Nobby's Beach SLSC Junior Boat Crew - 80s/90s? Nobby’s Beach SLSC R&R Team practicing a carry under the watchful eye of Trainer & Life Member Ian Murphy. Nobby’s Beach SLSC Nipperettes competing in the March Past event at a carnival.